OCTA round knife cloth cutting machine with 100mm / 4" circular knife blade and carbide tipped bottom blade for scissor like precision cutting. 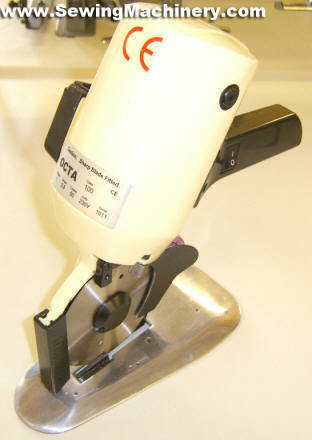 High performance small sized circular knife cloth cutting machine for super fine cuts in a wide variety of materials. Can use octagon shaped or round blades and is designed for effortless cutting of small lays or even single pieces. Mounted on a thin shaped roller base plate for good manoeuvrability and includes a one touch built in stone blade sharpening device. Comes complete in box with tools & instructions. Large stock of spare parts & blades available from our parts department. Fitted with 230V 50Hz single phase motor. 100mm Octagon shaped blade (round blade also available). Extra thin base plate with inset rollers.